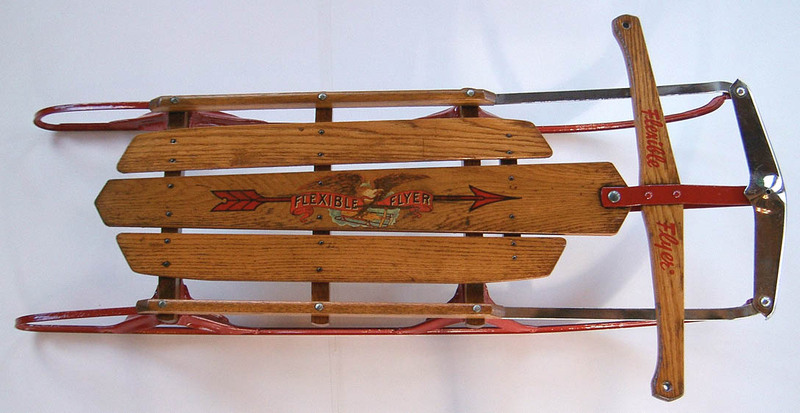 Tom is a recent sled enthusiast who began collecting, primarily Flexible Flyers®, in 2002. This is a “family affair” since two of his favorite sleds are gifts from his wife, Nancy, and brother, David. Why "Yule Race" for the name of his collection? "Well", as Tom explains, "people who really know me understand that the joy of the Christmas season goes on and on". "Yule" does not refer just to a brief winter interlude of twelve days. 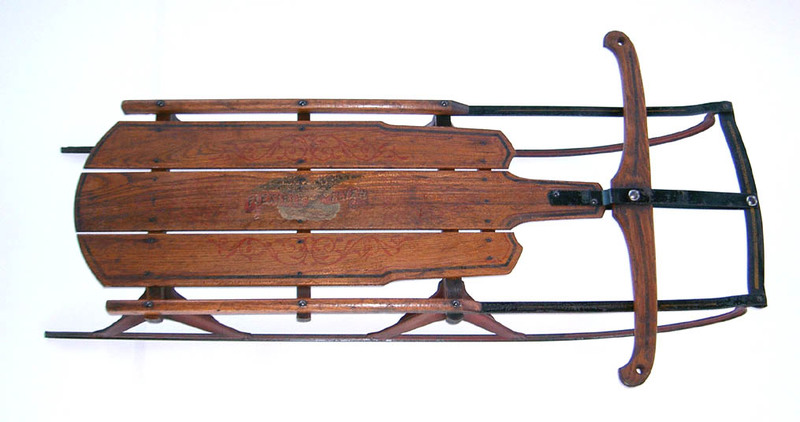 Also, if you are around the Evans and their sled collection-- and it snows --"you'll (Yule) race". Unfortunately, great sledding snows are few and far between in his home area of tidewater and central Virginia. Nevertheless, he fondly recalls the sledding days of his youth (more than a few years ago) in northern Virginia and Pennsylvania when “snows were deep and winters were cold”. 1. 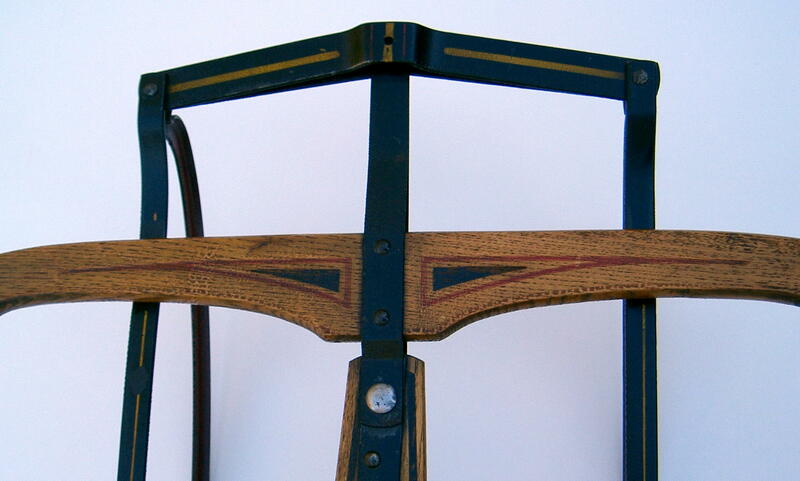 Fire Fly Coaster, No.10 a. c. 1890 - 1892 One of the very early sleds by the S. L. Allen & Company of Philadelphia , PA. after Samuel Allen patented the Flexible Flyer® sled in 1889. The Fire Fly was named after the company’s Planet Jr. Seeder. It has an all wood frame and no bumper. Reintroduced in 1935 with a partial steel frame. Length: 36”. Original finish. 2. Flexible Flyer® No. 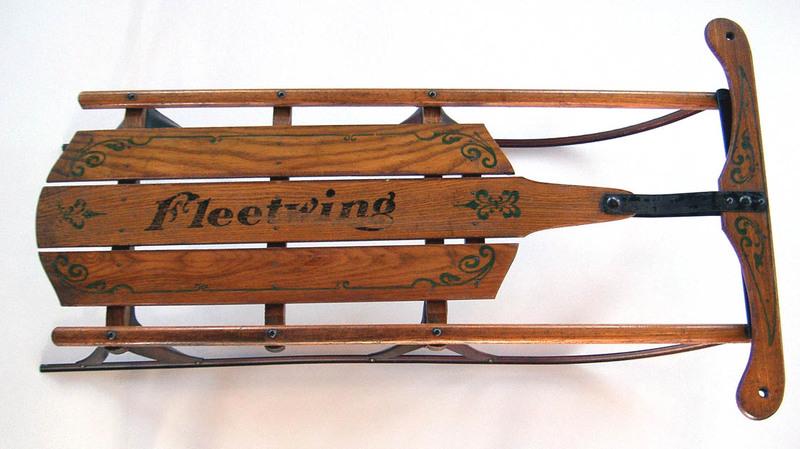 4. c. 1908 - 1911 This early Flexible Flyer® has wooden side rails that run the length of the sled and join to a wooden front bumper. The grooved runners attach to the rails at the front in a goose-neck configuration. 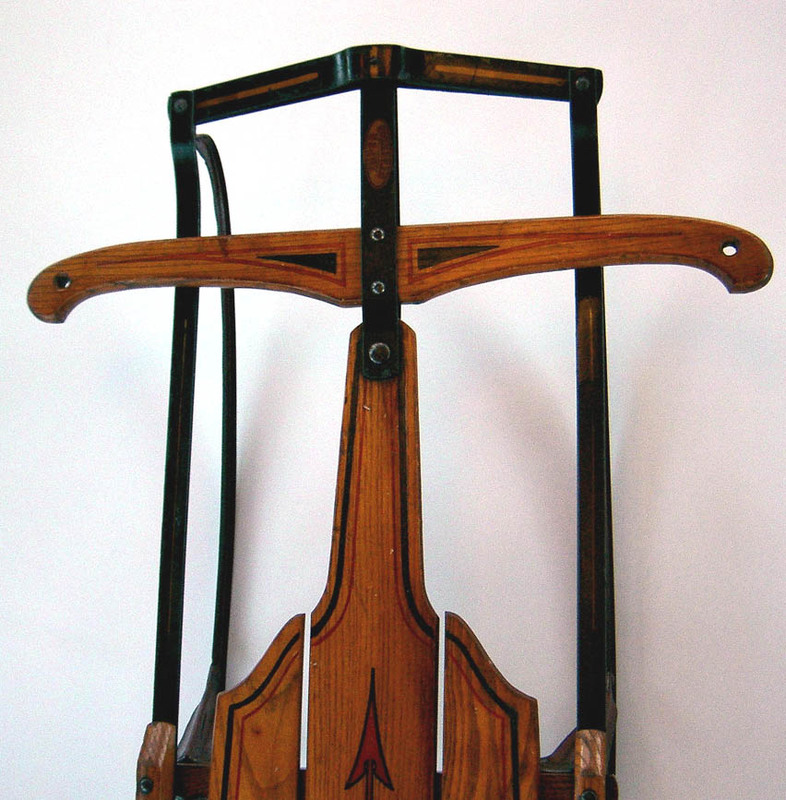 Grooved runners were introduced in about 1908 on larger models, possibly leading to the "B" series designation. Note: the original finish combines with rich brown patina of the wood. 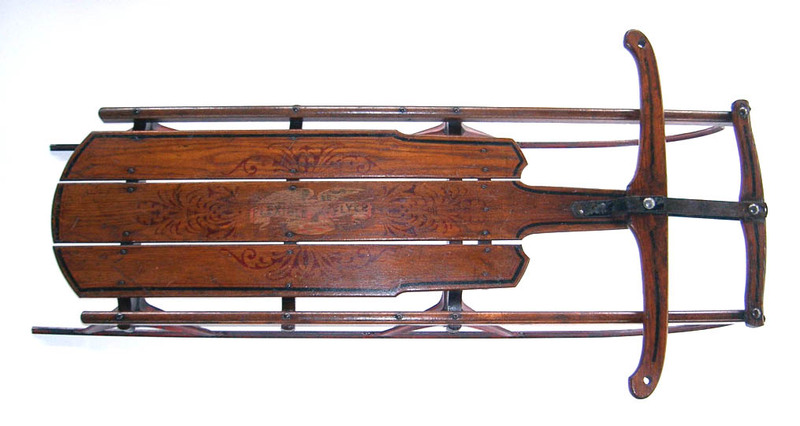 This sled was originally equipped with a pair of foot rests. Length: 50"
3. Flexible Flyer® No. 1 c. c. 1915 - 1920 The all wood frame of the earlier “B” series gave way to a steel front and partial steel side rails. 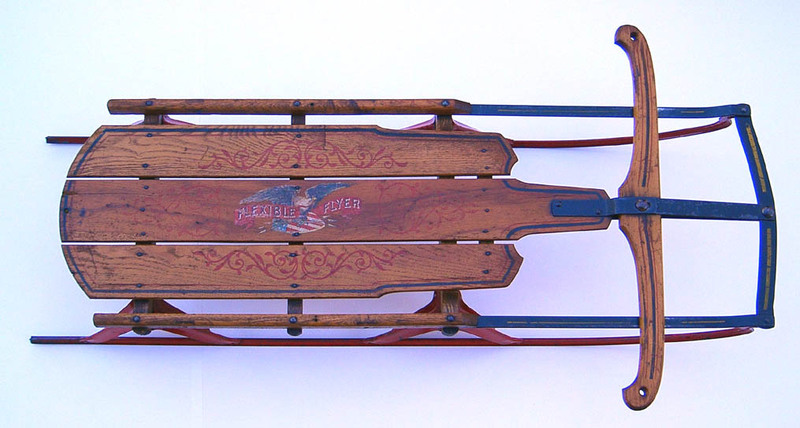 The Flexible Flyer® trademark with an American flag shield, along with an eagle and banner, was replaced in 1921 with one depicting a sled, together with the eagle and banner. Length: 38”. Original finish. A gift from my wife, Nancy. Original finish on deck and logo. 5. Flexible Flyer® No. 2 c. c. 1921 - 1928 The Flexible Flyer® trademark with an American flag shield, along with an eagle and banner, was replaced in 1921 with one depicting a sled, together with the eagle and banner. Otherwise, it was like the earlier models in the “C” series that began in c. 1915. 7. 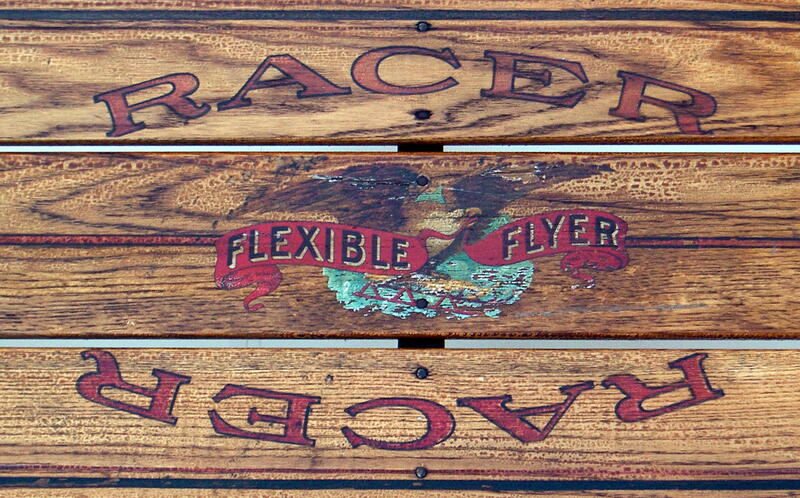 Flexible Flyer® Racer, Series D. c. 1921 - 1926 S. L. Allen introduced his first racer in 1906. It was “built low and rather narrow, with unusual length of runner extending well forward and to the rear, insuring high speed”. The D Series retained the one piece steel bumper of the earlier Racer C Series, with a steering design essentially unchanged from the first steel fronted sleds. The steering was enhanced in the later G series with the super steering (see photos of the bumpers of the Series G Racers below. 8. 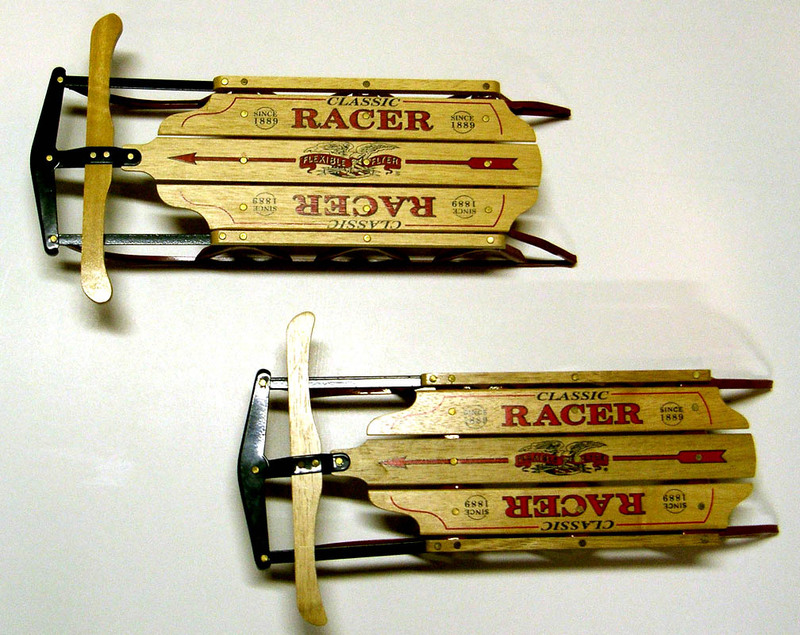 Flexible Flyer® Racer, Series G. c. 1930 - 1935 S. L. Allen introduced his first racer in 1906. Length: 57”. Original finish. A gift from my brother, David. 10. Flexible Flyer®, Airline Patrol, No. 44. 1935 The “Airline” series (1935-49) introduced “Safety Runners”, with the model name displayed on the deck. Beginning in 1936, wings were printed on the steering bar. Others in this series included Ace (37), Pilot (41), Pursuit (47), Junior (51), Chief (55), Racer (60), Cruiser (65), Eagle (151), and Commander (105). 11. Flexible Flyer®, Airline Patrol, No. 44. c. 1950-1954 In 1950, the “Airline” series displayed the name (e.g., Airline Patrol) on the underside of the deck. The no. 44, along with 37, 55, and 65 were “Standard Models” with wider decks and straight sides. No.s 41, 47, 251, and 60 were “Racing Models” featuring narrow, sloping and tapered decks. This particular sled has the apparent experiment of changing the steering mechanism. Note the double riveting of the front cross pieces. In sleds before and after, the side rails, both wood and metal, were riveted together and the piece keeping the top boards floated free from the sides of the sled. 13. Flexible Flyer®, Airline Pursuit, No. 47 H. c. 1955 - 1960 Another sled in the “H” series that followed the name and numbering pattern of the “Airline” series introduced in 1935. Length: 51”. Refinished for my older granddaughter, Katherine Faith, age 7, as a Christmas present (2004). 14. Flexible Flyer®, No. 41 J. c. 1960 - 1968 The “J” series was introduced about 1960 and continued until 1968 when S. L. Allen Company and Flexible Flyer® were sold. As in the earlier “Airline” and ‘H” series, the sled number (e.g., No. 41) corresponded to its length. The No. 41 was a “Racing Model”. Length: 41”. Refinished for my younger granddaughter, Hannah, age 4, as a Christmas present (2004). 15. Flexible Flyer®, No. 51 J. c. 1960 - 1968 No. 51 J is a “Racing Model”. 16. Flexible Flyer®, No. 55 J. c. 1960 - 1968 The No. 55 J was one of two “Deep Snow Models”, along with the No. 65. These were higher than the “Racing Models”. Red or black painted side rail were options. Length: 55”. In 1968, S. L. Allen Co. and Flexible Flyer® were sold. 1969, “Winter Products Medina, Ohio” appears on underside of the deck. The pre-1921 trademark is displayed. 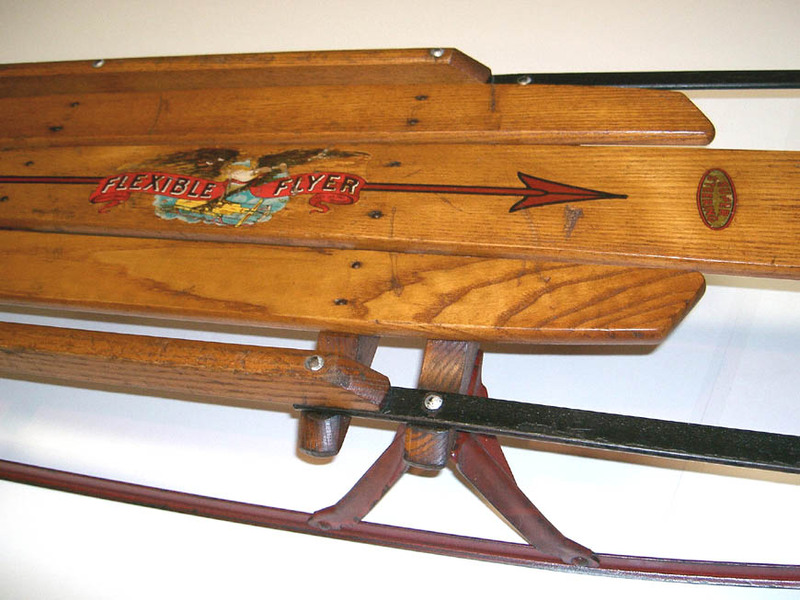 From 1973 through 1993, the sled is Blazon-Flexible Flyer®, of West Point MS. In 1998 production was moved to China , and ended the following year. 17. 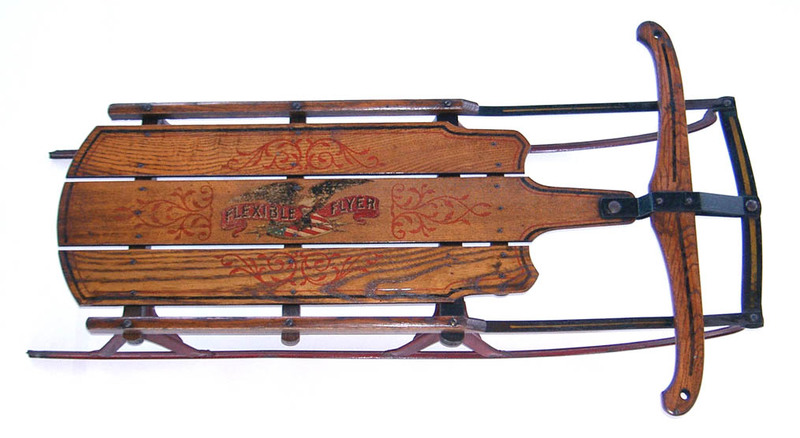 Flexible Flyer®, “Classic Racer Miniature Sled”. C. 1998 - 9 Manufactured by the Roadmaster Corporation. Length: 16”. Christmas (2004) presents for my two grandsons, Marcus and Tommy, both under the age of 2. It’s never too early to introduce them to sledding! 18. Fleetwing. c. 1920’s. This was, perhaps, one of the earliest sleds produced by the Auto-Wheel Coaster Company of North Tonawanda , NY , incorporated in 1921. Its predecessor was The Buffalo Sled Company, founded in 1904. 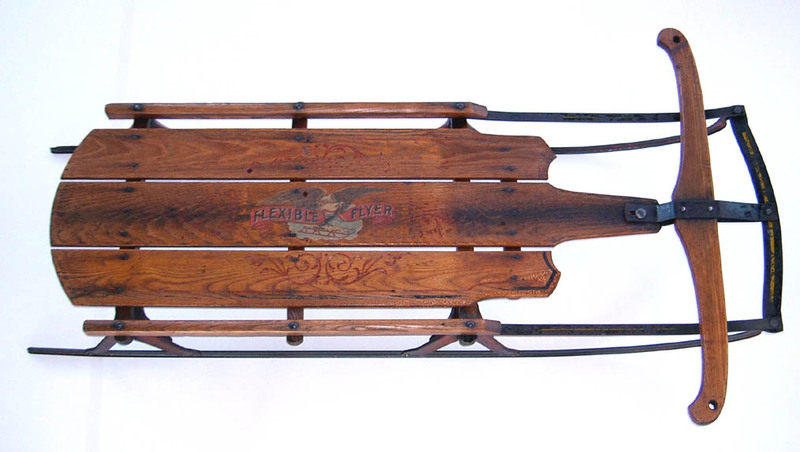 This sled, with its all-wood side rails, has a designation on the bottom of the deck as “001” or “100”. Length: 37”. Original finish. 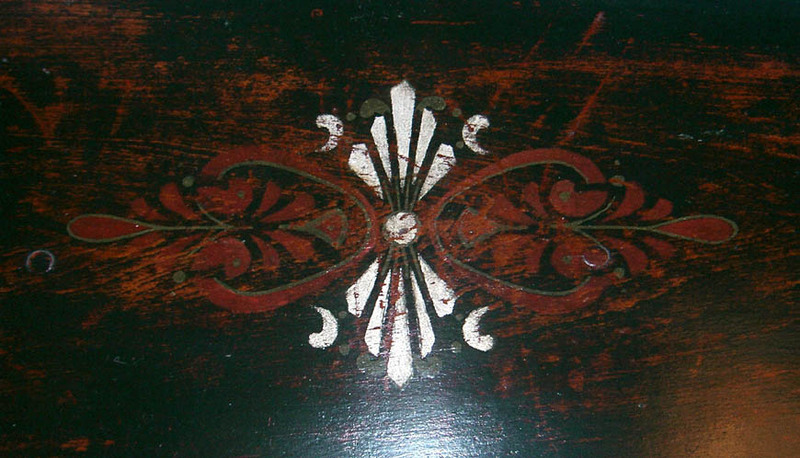 Paint and stenciling are original. There are no markings or names to indicate the manufacturer. 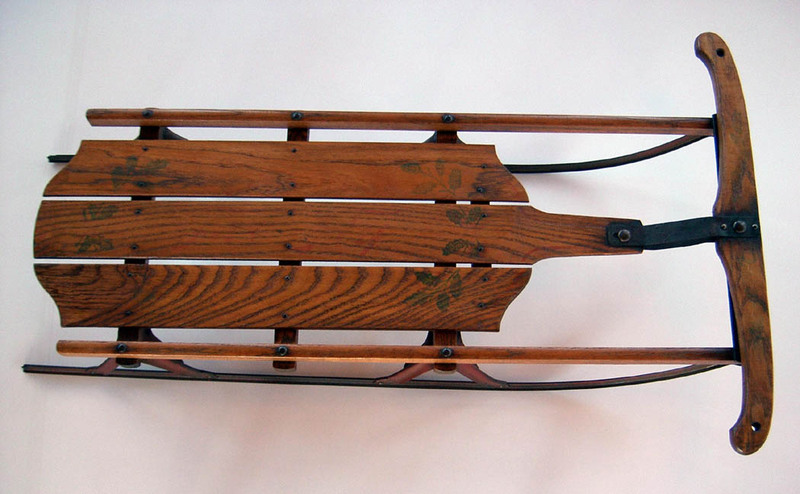 This sled came from an estate in upstate New York . The person from whom the sled was purchased saw a photo of the sled, with a little girl (an ancestor of the estate owner), being pulled by a Newfoundland dog.